The settings of SkyCiv Structural 3D allow you to make changes to the general, view and solver settings of the software. These settings can be accessed by clicking the 'Settings' button on the top bar when using SkyCiv Structural 3D. The three tabs at the top of the settings box will allow you to toggle between the various settings. Unit System: Choose between Metric (kN, m, MPa) and Imperial (kip, ft, ksi) unit systems for force, length and pressure. Convert Material Data: If this is ticked on, then whenever the unit system the changes the material data values will be converted to the new unit system. 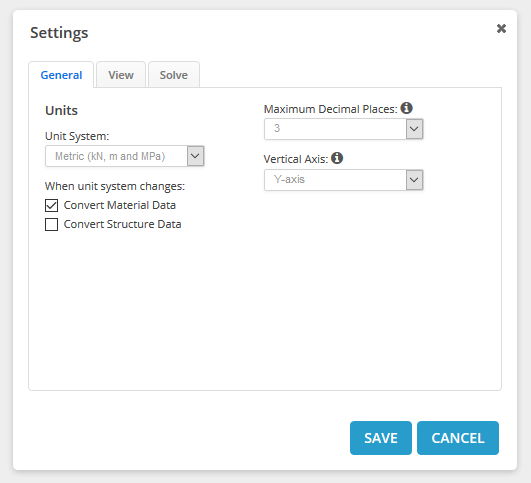 Convert Structure Data: If this is ticked on, then whenever the unit system the changes the data values of the structure (except materials) will be converted to the new unit system. Maximum Decimal Places: The rounding of all results on diagrams to a specific number of decimal places. The default is 3 decimal places. Vertical Axis: Choose which axis you prefer as the vertical axis (Y or Z). 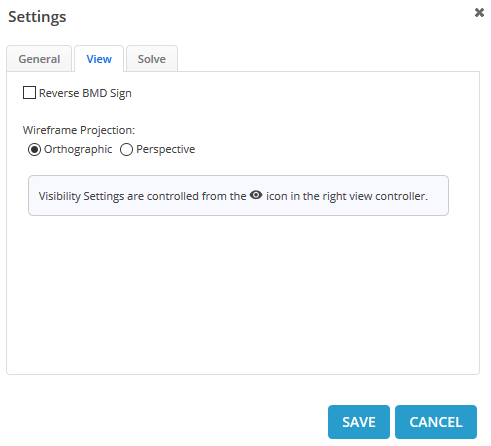 View settings controls how your wireframe model is viewed. Reverse BMD Sign: This setting reverses the sign convention of the bending moment diagrams in post-processing. Projection: Select one of these options to change the current projection mode view of your wireframe model. Perspective view provides a more realistic view, but it is harder to visualize 3D coordinates and lengths compared to orthographic projection. Note that the visibility settings of the model can be changed within Visibility Settings. 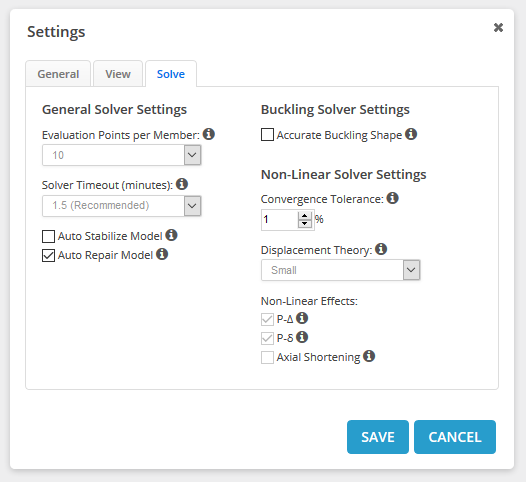 These settings typically relate to how the solver will calculate the solution for the analysis of the model. Evaluation Points per Member: The number of evaluation points used for each member. Increase this for higher accuracy results but slower solve time and responsiveness. SkyCiv highly recommends leaving this at 5 for larger structures and 10 for smaller structures. Solver Timeout: The maximum time span allowed for the solver to run before timing out (measured in minutes). Change this based on the size of your structure. 1.5 minutes is the default and should be more than enough time for most structures under 300 members. Auto Stabilize Model: The solver will attempt to automatically stabilize your model if it has trouble converging due to instabilities. This is especially useful with non-linear analyses that fail to converge. Auto Repair Model: If ticked on, then the Repair Model function will automatically run before solving to check if the model has issues that may need repairing. It will only check for missing sections and nodes that need merging. Accurate Buckling Shape: Improves the accuracy of the displayed buckling shape but takes longer to solve. Enabling this will NOT usually affect buckling values and factors. Only applicable when performing a buckling analysis. Convergence Tolerance: The Non-Linear Solver will continue to solve until this tolerance is met. A smaller number takes longer longer to solve as a more accurate solution is obtained during convergence of residuals and displacements. Displacement Theory (Small or Finite): This controls the displacement theory for the Non-Linear Solver. Finite displacement theory is similar to Large displacement theory in that it takes into account the full movement of the structure during the analysis and is suitable when displacement is large. The default is "Small" as usually displacement is not so significant - in this case the results between Small and Finite theory should be similar. Non-Linear Effects: When the displacement theory is changed, certain non-linear effects are taken into consideration as indicated by these checkboxes. At the moment P-Delta (P-Δ), P-delta(P-δ) and Axial Shortening effects cannot be toggled by the user and are automatically chosen depending on the Non-Linear theory chosen.